Want to get out of harmful investments? Frustrated by how banks are using your money? Angry at an unfair system? I understand: and my live Divesting + Hacking Capitalism events are gonna help. Learn more about how to put your money where it matters, with small banks that do good. Get excited, get your questions answered, and DO THIS!! None at this time – check back later or reach out to me to book me in your community! Read up on Divestment Strategies, or read my story about choosing to pick a bank I don’t hate. 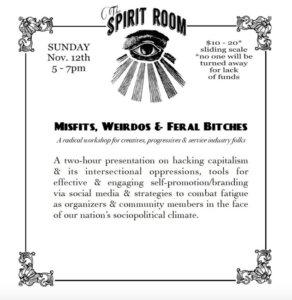 May 25 – 27, 2018 — Hacking Capitalism participatory workshop at the GroundShift Activist Camp, gathering at Camp Hilltop, a family-run camp in the Catskills. June 17, 2017 – Hacking Capitalism workshop @ the Allied Media Conference, as part of the Resourcing and Sustaining our Movements track, in Detroit. Saturday April 15, Brooklyn Heights Public Library, 2-4pm. Join neighbors and community in downtown Brooklyn to learn exactly how to manage your money as ethically as possible. FREE thanks to the Library. Saturday April 8, Action Item Fair, 12:30pm. Taking activism offline and into daily life is the goal of these events, and they are a day chock full of amazing organizations sharing their work and ways you can plug in — come out for the whole day! 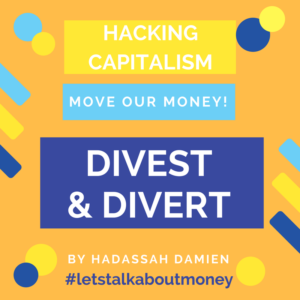 Part of the Divestment Day activities in NYC, hosted by B.A.N.K.E.R.S. 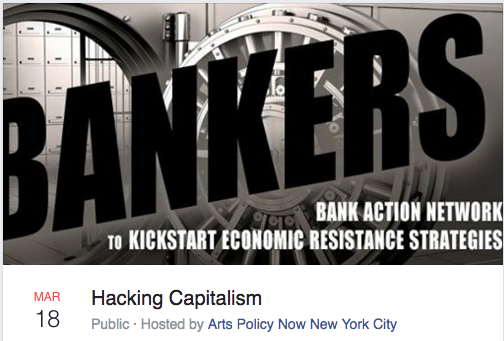 : Bank Action Network to Kickstart Economic Resistance. RSVP here for the lower Manhattan address.